Gerald Ford, US President from 1974 to 1976, has died aged 93, his widow Betty has announced. 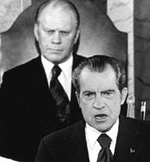 Ford became America’s leader in the exceptional circumstances after Richard Nixon’s resignation and his presidency was always overshadowed by Nixon. He chose ‘A return to honesty’ as the theme of his presidency although his decision to pardon his predecessor for the Watergate scandal was very controversial. He was an otherwise unexceptional leader and he contributed to the economic consensus that brought America low during the 1970s. "Laura and I are greatly saddened by the passing of former President Gerald R. Ford. President Ford was a great American who gave many years of dedicated service to our country. On August 9, 1974, after a long career in the House of Representatives and service as Vice President, he assumed the Presidency in an hour of national turmoil and division. With his quiet integrity, common sense, and kind instincts, President Ford helped heal our land and restore public confidence in the Presidency. The American people will always admire Gerald Ford’s devotion to duty, his personal character, and the honorable conduct of his administration. We mourn the loss of such a leader, and our 38th President will always have a special place in our Nation’s memory. On behalf of all Americans, Laura and I offer our deepest sympathies to Betty Ford and all of President Ford’s family. Our thoughts and prayers will be with them in the hours and days ahead."